This thread is for discussion of the Special Stage, ideas for its appearance, playability, and ways to get it functional only. Important: Could anyone still having problems please run the DirectX End-User Runtime setup from Microsoft's website to ensure they have the latest DirectX files. Two users who have had the same issue have resolved the problems by doing this and are now able to run the standard build without problems. PM Canned Karma if you have any questions about this. Nice start Nineko, Hope to see some good progress with this soon as I am interested to see how it would go. Thanks Nineko, I'll get that added to the OP. Now the shapes don't stand out. Just some opacity changes between the many layers of my project. And hey, if you really want the constellations, email me an image with those that you want. Just resuggesting my questionable ideas for the SS. This is looking loads better. Is there any chance to add some animation with shooting stars. Also. I was just thinking as a concept idea. What if the stars were twisting around in a circle for some trippy flare. Will do. I'll get something sorted that will look the best but also show off iconic constellations. Are the tubes going to be in full 3D now instead of a 2D background? 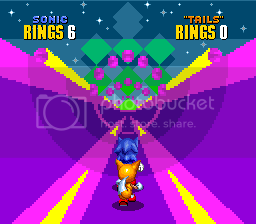 I remember one of the mobile versions of Sonic 2 had it in 3D, and Saturn 3D Blast would be a good example to follow. just without the transparency and bloom. 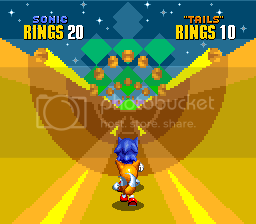 Just throwing this out here: the way I saw it, going off the original background (might want to add this to the first post), is like a very early sunrise: you should be able to see the stars at the top and bottom, where the darker, blue sky is, but you can't see the stars where the "sunlight" is (in the center); thus they'd fade out as you move to the center. Just my opinion though. Noted. I'm working on animating it now, so it may be a while before I get to that. There are three more palettes in 2-player mode for a total of ten. I didn't see these referenced anywhere else so I thought I'd post them here. I can't be the only one here who never knew that before!? I was working on something but it looks like you guys seem to have settled on a background. Might as well post it so I don't feel like I wasted my time. 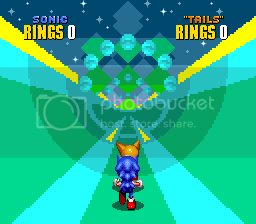 Here's just something I threw together for you to guys play around with, just to give you some ideas, since I'm not keen on the idea of just finding a jpeg of stars and throwing it in there. Keep working on that Chimpo, I like the style you have going on for the diamonds. Can you put up those with a transparency behind them so we can play around with fitting them to additional backgrounds?